So the axle at the rear of the machine has gone to the left, sticks out at the left and has fallen out at the right. This made the belt on the right side of the machine loose. Additionally, the front-to-back axle that holds the print head is come out of the black plastic holder on the belt at the back. (The design of this holder looks a bit weird to me since the metal axle is not fully enclosed by the plastic, seems like it could "pop out" easily and this is what happened). 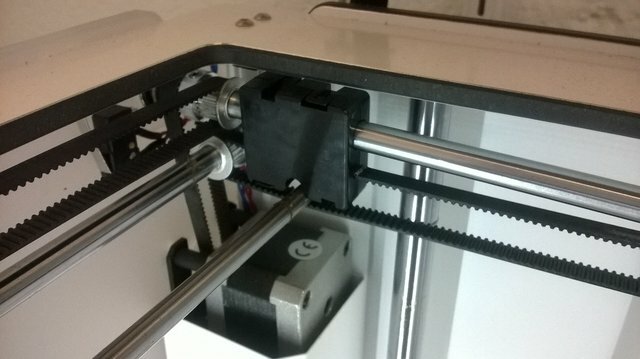 The only odd thing I'd noticed up until it fell apart was that the nozzle seemed to scrape, vibrate or drag a bit as it was making fast moves across the top of the print. It has left lines on the top of the print where there are moves before. I don't know what could cause this - naively I'd say the "nozzle was too low" but the top of the print is dictated by where nozzle is putting plastic and the build plate level seems fine too. This has never happened to me (on purpose) but is very easy to fix. Permanently. Basically there are pulleys and plastic spacers near the 4 corners of the machine - 8 of them. They keep the axle from sliding out of the machine (but don't prevent it sliding inward). The side where it slid out - the pulley there has a set screw which was not tight enough. Just push the axle back into the hole where it belongs and line it up so it is all the way in and won't go any further, then slide the pulley nearest the "fell out hole" against the outer wall and tighten the hell out of that set screw. Those are 2mm hex set screws. Do not use the wrong size tool. If you use an L shaped tool you should be tightening enough for it to hurt your fingers. tight enough to actually twist the tool slightly where you are scared it will break. Don't use pliers or other torque increasing tools as then you might break it, but very very tight. 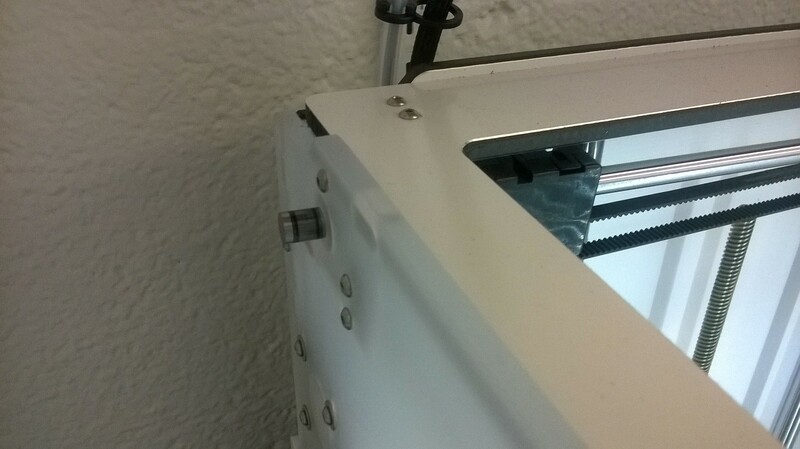 You can add lock tite but I never did and my screws on all my printers have held for years now. As far as the center/thinner rods that go through the head - they can just snap back into the side blocks - you have to push with a certain amount of force - enough to bend and damage the thicker rods (or those thinner rods) so brace yourself against the frame and not against the rod. Use your other hand to hold the sliding block so it doesn't tilt and squeeze/snap it back in. True but then it would be hard to manufacture. I was reading up on the warranty information and it says it's void if I try to repair unless it's "official" ultimaker support advice somehow. I see you're a moderator on this forum - does that mean I can follow your advice and not void my warranty? Nope. But you'll be fine. Just be gentle - this is easy stuff. Who did you buy it from? printedSolid/dynamism/fbrc8 all have great service. They would rather you fixed it yourself than have to have it shipped back and forth (where it will likely get damaged further by the elephants that work for shipping companies). Actually fbrc8 would probably love to know the serial number so they can figure out who messed up when assembling your machine and remind them to check the torque on every set screw. Well, I might have to have words with our purchasing department because I put in a requisition to buy it from "Dynamism, Inc.", who I know to be an official reseller and I'd used them before. But they bought it from "Ideal System Solutions, Inc." (idealssi.com) instead and I don't know why (unless it was to buy it for 2950 instead of 2999 USD). That company doesn't appear to be on the list of recommended Ultimaker resellers. I'm currently waiting for an e-mail back from their sales/support person, so will wait until I get that before proceeding. I agree shipping it around isn't the best. I have pulled apart so many things on my um2 without having a clue what I'm doing. I haven't broken anything yet. You will eventually have to take the head apart almost for sure to fix some clog or something. 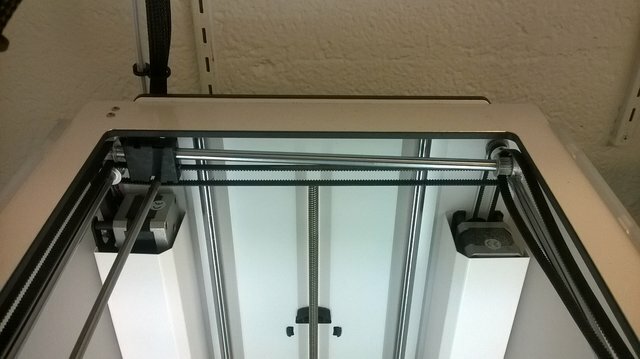 You will have to remove the bowden some day to get some stuck filament out. You will have all kinds of issues. Eventually. Pushing the rod back in the hole and back in the slot is not a big deal but sure go ahead and wait. Basically I think if you damage something while trying to repair it then you might pay a small fee for some part. Typically. But no promises from me. I put the serial number into the Ultimaker "get support" link at the bottom of the front page of their site and it directed me to get support from fbrc8, so I'm just e-mailing them with all this info. I think the other company was probably just a reseller. [update] They replied quickly and said I'm fine to repair it myself. So... I try to push the axle at the back into the right-hand hole where it fell out, but it actively springs back to the left and comes out again! I think it's being held in place by the very tight band joining it to the stepper motor at the rear left corner. So in summary the pair of pulleys on the left of the rear axle are too far to the right. I guess I need to unscrew them and move them to the right place? This would be a bit easier if I could get the whole rear axle out of the machine. We've just tried a repair: undid the set screw on the *left-hand* set of pulleys on the rear axle and moved them to what looked like the correct position (with the rear axle back in place), then tightened both sets of pulleys on the rear axle. The metal rod holding the nozzle just snapped back into the black plastic block in with a bit of force. Moving the printer head to the edge showed we'd skipped 2 belt teeth on one side (the teeth appear to be 2mm each), so we took the rear axle back out again so one of the front-to-back belts was loose, checked and put it back. The "nozzle grinding on the top of the print" I mentioned at the beginning was probably because the rod supporting the nozzle had fallen out of its holder at some point. I just did a first layer, looks pretty good. Instead of popping the axle out a second time it's easier to just loosen the set screws on a few pulleys, let the tension even out and position the head properly and then retighten. FYI there are belt tighteners *inside* the side blocks. Sometimes in transit, set screws in the pulleys will vibrate just loose enough to cause havoc. If the back pulley on the right hand rod is loose, you'll usually see a slanting print (with a left-right slant), and since the front panel is solid, that's about the maximum damage you'll see happen. 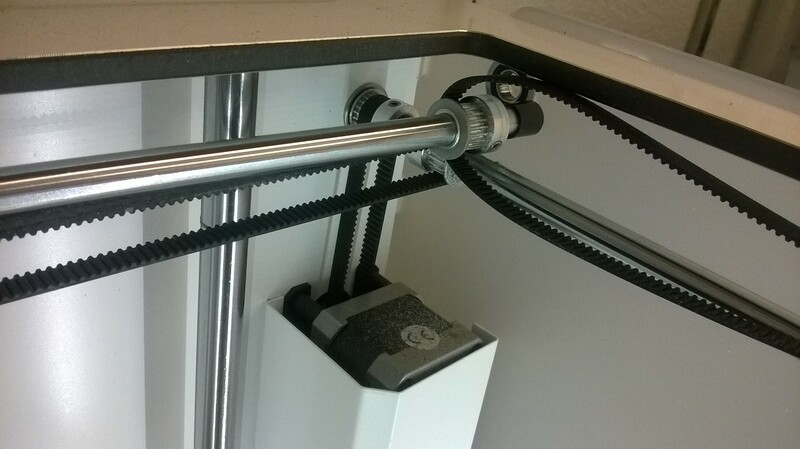 One of the pulleys on the Y axis is loose, the rod is more likely to slip out since on the front and back rods that run through the side panel, the set screws on the pulleys are the only thing holding them in place. Ah, I didn't think of loosening the pulley again and letting it slip around instead of manually moving the belt by 2 teeth. That sounds like it would have worked. Anyway, I just got a basically flawless large print out of this over the weekend, so I think it's fixed for now. Thanks both for your help. I'll bookmark the X-Y axis instructions for future use.